Mild traumatic Brain Injury (mTBI or Concussion) is an increasingly common public health issue in sports, military environments, and life in today’s active world. Despite a great deal of study and public attention to this disorder, knowledge about optimal diagnostic, prognostic, and treatment information remains lacking. Neurosensory symptoms have been shown to be the most frequent complications of mTBI in both the acute and chronic setting. 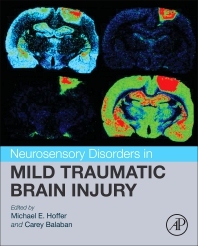 Neurosensory Disorders in Mild Traumatic Brain Injury brings together both the basic science work as well as the clinical work in mTBI into one volume to provide a comprehensive examination of the neurosensory issues associated with this disorder. Coverage includes chapters on defining mild Traumatic Brain Injury, neurosensory consequences, neurosensory disorders in clinical practice, and diagnosis and treatment for neurosensory disorders in mTBI. This book is written for clinicians, researchers, residents and students in neurology and neuroscience. Michael Hoffer, MD, FACS is Professor of Otolaryngology and Neurological Surgery at the University of Miami, Miller School of Medicine. Dr. Hoffer assumed these roles after an over twenty year military career in which he studied mild Traumatic Brain Injury (mTBI) on active duty service members . Dr. Hoffer performs both basic and clinical research and has an active practice in Neurotology. Dr. Hoffer’s lab focuses on traumatic damage to the inner ear and brain. He has authored or co-authored over sixty papers and has a particular expertise in dizziness and balance disorders as well as neurosensory consequences after mild traumatic brain injury (mTBI). Dr. Hoffer and his collaborators have done pioneering work on pharmaceutical countermeasures for mTBI as well as optimized diagnosis and management of neurosensory disorders seen after mTBI. Dr. Carey Balaban is Professor of Otolaryngology in the School of Medicine, with secondary appointments in Neurobiology, Communication Sciences and Disorders, and Bioengineering and Director of the Center for National Preparedness. He earned his bachelor’s degree in History at Michigan State University and his Ph.D. degree in Anatomy from the University of Chicago. Dr. Balaban’s research program has been supported with funding from a variety of sources including the NIH, NASA, the Office of Naval Research and several other agencies and corporations. He has extensive experience in conducting multidisciplinary, cross-cutting research in biomedical sciences, engineering and social sciences and has participated in the emerging fields of augmented cognition and neuroergonomics. His over-riding interest has been formulation of mathematical models, heuristic models and teleological approaches to interpret data from basic science experiments in terms of behavioral and clinical phenomena. Using this approach, he has examined the interplay between neurological and psychological features of co-morbid aspects of balance disorders, migraine and anxiety disorders. His recent work is extending the implications of these models to analogous features of mild traumatic brain injury, acoustic trauma and post-traumatic stress disorder, including work in the nascent field of mass spectrometric histological imaging. He has also participated in developing new patented technologies to gauge situational awareness and cognitive engagement from postural orienting responses and decision support software for responses to mass casualty events. In addition to more than 170 peer-reviewed basic research and scholarly articles and two patents, Dr. Balaban is an author of two books on seventeenth century medicine.